I started to use Ghee in my cooking and the first reason was that when I fry eggs in butter it splatters so much and I got butterdropps everywhere. But if you fry in Ghee, you don't get that. Ghee is mainly used in indian cooking and you can buy it in stores where they sell food and ingredients for foreign countries. But I prefer to do my own, then I know what I get. 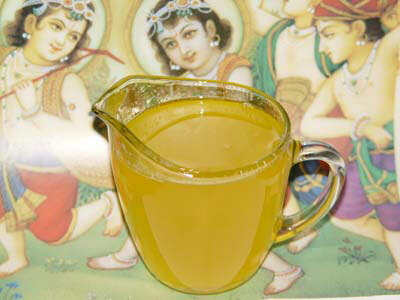 I found a good food blog where it is described how to do Ghee. The best of all is that Ghee dosen't content milkprotein or casein wich actually is not so good for humans. There are some small differences between how to make Ghee, so look at more than one filmclip to make sure you really get how to do it before you try it. BE CAREFUL - HOT OIL IS VERY HOT AND CAN START TO BURN! NEVER LEAVE IT UNATTENDED! !